Google Docs is convenient, cheap, and compatible with just about any platform, making collaboration incredibly simple. It’s also infuriating, incomplete, and limited. Google Docs wafts in the cloud, just beyond your tinkering fingertips, and you’re at the whim of the Google engineers who control the tweaks, fixes, and enhancements. Since launching Google Spreadsheets in 2006, Google has steadily improved Docs to support complex text documents, worksheets, tables, forms, and presentations. You might have to wait for its software wizards to make the big changes, but you can still apply a few workarounds and hidden features. Want to trim the number of Google Docs browser tabs? Compensate for the lack of a guided spelling checker? Create shortcuts for frequently used text? To make your overall editing experience a bit better, read on; we also offer some tips that you can use with Google’s spreadsheet and presentation applications. Desktop text editors can use plug-ins and utilities, such as TextExpander for OS X and iOS, to autocomplete frequently repeated words and phrases, such as your professional title or an oft-used line of HTML. If you want to move your text editing to the cloud, Google Docs provides a similar--but limited--function. Let's say you're a teacher who constantly writes "Needs more explanation" in your students' papers. To save time, go to Tools, Preferences from inside a text document in Google Docs. In the pop-up window that appears, under 'Automatic substitution', type nme below the 'Replace' heading and Needs more explanation below the 'With' heading. Next, click OK.
Back in your document, type nme and press the spacebar: You should see "Needs more explanation" appear automatically. If it doesn't work, go back to Tools, Preferences to make sure that 'Automatic substitution' is checked. 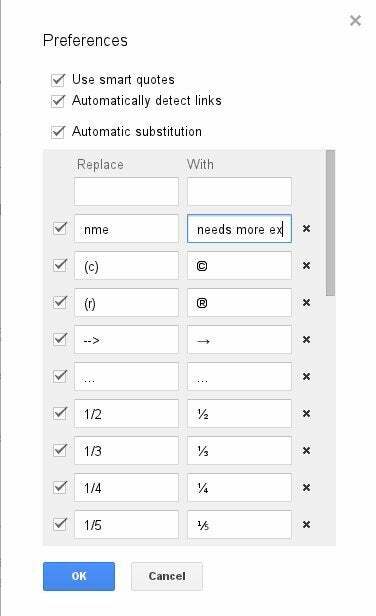 Try to choose substitutions that are short and use unique letter combinations, so that Google Docs won't mistakenly overwrite a desired word with a substitution. Substitution settings are universal, so your canned text will be available to you in any text document in Google Docs. One limitation to this feature is that Google Docs inserts an automatic substitution only as a single line of text, so full signature blocks are beyond its capacity--for now. If you prefer to use plain desktop text editors such as Emacs, Gedit, Notepad, or Vim, you may find that files created in those apps won't display in Google Docs. Instead, you'll be greeted by something similar to the smiling image here. This happens when you upload a text file with a filename extension that Google Docs can't recognize (such as .sh for Bash scripting files), or when your plain text file lacks an extension entirely. Before you upload a plain text file to Google Docs, right-click the file and select Rename, and then add the .txt filename extension to the end. Now you'll have no problem reading your document in Google Docs. Unlike most other text editors, Google Docs has no formal spelling check process and instead checks your spelling on the fly, as many webmail programs do. If you see a word with a red underline beneath it, you can right-click it to view spelling alternatives. That technique works, but it isn't as good as a guided program that flags all of your potential spelling mistakes one by one. 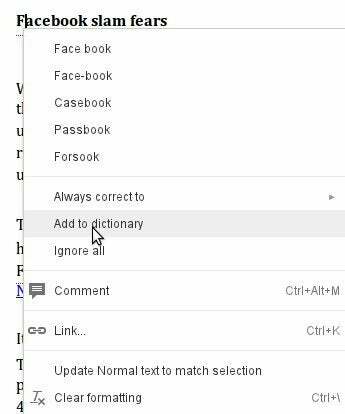 To make Google Docs guide you through all of your typos and errors, use the keyboard shortcut Ctrl-; to go to the next misspelling in your document and Ctrl-[ to see the previous one. Google Docs compact controls (top) and noncompact controls (bottom). Google Docs wastes valuable screen real estate by surrounding the menu and toolbars with big empty spaces. That extra space, added to your browser's window dressing (called "browser chrome"), leaves you with less usable room to get your work done. To improve this layout disaster, go to View, Compact Controls or press Ctrl-Shift-F from inside a document. This feature reduces the menu-bar size for text documents, drawings, spreadsheets, and presentations. Keep in mind that you must set this preference for every separate document type. So if you set compact controls in text documents, for instance, your spreadsheets will not use this layout until you also set it in the spreadsheet editor. 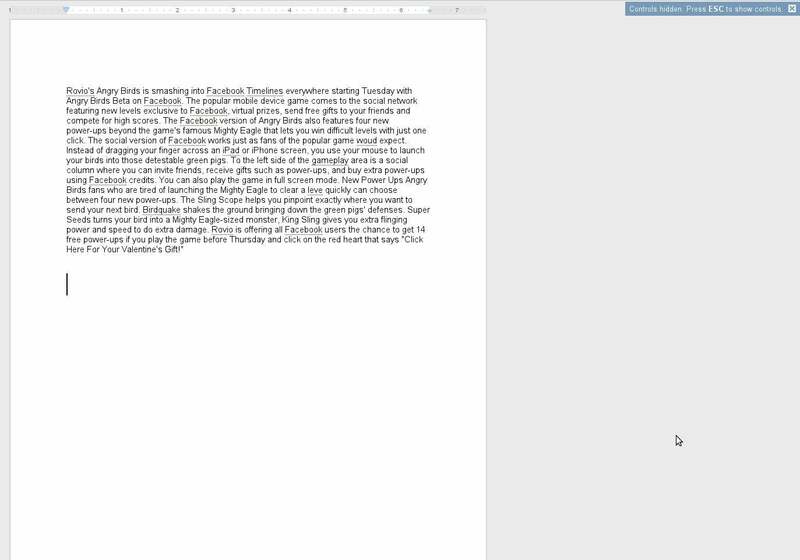 If you want even more space, try viewing your documents in full screen. This setting does not expand into your full display size, but it does take over your entire browser tab and hide all of your Google Docs menus and toolbars. Full screen is a good choice for keyboard shortcut users. Setting a document to full screen is not a permanent preference, however; you must enable it every time you open a document. Are you collaborating on an online document, but going nuts due to the constant email notifications from the project? You're not alone. Reacting to user frustrations expressed in several Google Docs discussion threads, Google created a feature that lets you stop email notifications on a per-document basis. To stop email notifications, open the offending document, click the Comments drop-down menu at the upper right of the screen, and select Notification settings. In the pop-up window, select Don't send me any email notifications for this doc (not recommended). If a global opt-out is too extreme for you, several filters are available. You could, for example, choose to be notified only when you are mentioned in a comment, or when someone replies to something you commented on. Once you have the settings you want, click OK.
By default, Google Docs opens each of your documents in a new tab, but you can change its behavior so that it takes up only one tab at a time (for the most part). Click the settings cog in the upper-right corner of your main Google Docs menu (the screen that lists your files), and select Settings. On the next screen, under the 'General' tab, find the 'Where items open:' setting (it should be the third item), and select In the current window. Click Save at the bottom of the menu to exit the screen and return to the main Google Docs page. Your documents will now open in one tab, except when you create a new file or open a document from another document by selecting File, Open.